Now that HTC’s latest software enhancements in version 6.0 of their Sense software skin are soon to be made official, it’s time to start talking about updates for older devices. The most obvious candidate for some update goodness is HTC’s 2013 flagship, the OG One. According to leaker @LlabTooFeR, we’ll be seeing the update (presumably only for unlocked and developer models) sometime in May or June. 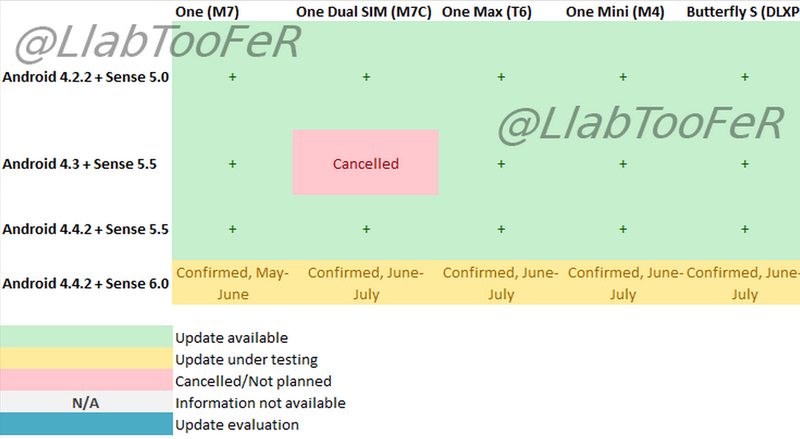 The other devices confirmed to be receiving the update are the dual-SIM One, One Max, One Mini, and Butterfly S, with the 2012 One X and One X+ smartphones currently having no plans for an update. As far as the actual enhancements in the update, we know pretty much everything — a video leak of Sense 6 and ROMs for the original One have told us what we can assume is all there is. The main points include new gesture features to wake up the device (a la LG) and enhancements to the look of stock applications. Also updated is the Camera app with a couple tweaks. A video showing off some of the Sense 6.0 features is embedded down below.